The schedule was lighter on Sunday and, as it turned out, I had already seen many of the participating authors in other panels the previous day. 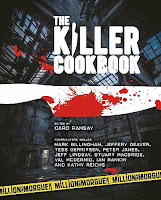 So I decided to attend Caro Ramsay’s event featuring the preparation of dishes taken from The Killer Cookbook, a 2012 paperback collection of recipes--supplied by crime-fiction writers--that she edited. I had heard from one of the scheduled panelists, Craig Robertson (Witness the Dead), that he was going to make blood pudding. How appropriate. By the time the doors to the MacLaren Suite (where this panel presentation was to take place) finally opened, though, the program had changed. 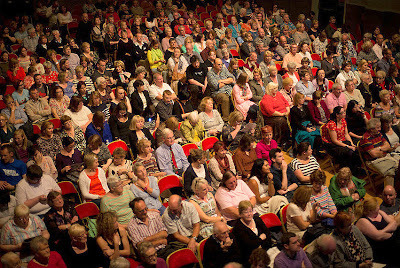 According to Ramsay, bustling behind a long table heaped over with glasses, spirits, jars of condiments, and fruits, the folks from Health and Safety had been along and determined that seven mystery authors cooking with high heat and sharp knives was not on. However, mixology was OK. So two squads were lined up: Team Boy (Craig Robertson and Gordon Brown) vied against the women on Team Blonde (Lin Anderson, Alex Gray, Catriona McPherson, and Ramsay). Team Boy chose to make Tom Black’s Killer Margarita (Black being the husband of Sue Black, director of the Centre for Anatomy and Human Identification at Dundee University), while Team Blonde tackled The Peter James Vodka Martini Writing Special. I looked about and no one else seemed to see the irony that in the middle of Scotch country, we were straining to sample tequila and vodka. Since there wasn’t quite enough booze, Team Blonde also made Aline Templeton’s Bloody Mary Tomatoes. In the meantime, Alex Gray distributed scones served with raspberry jam and “squirty” cream (UK-speak for whipped cream in an aerosol can) that she had made earlier at home, while someone else was passing around “flapjacks,” oats mixed with dates and honey. Call it the Stirling Silly Season or just a Bloody Good Time; either way it was tasty chaos. Unfortunately, I had to leave the party early to queue up for the festival’s finale: “At the Top of His Game,” a sold-out event showcasing author Lee Child. Author Peter Guttridge (The Devil’s Moon) once more acted as interlocutor, and he took Child down memory lane to his boyhood in Birmingham, England--which, Child readily admitted, could get quite obstreperous. In fact, Child was a bit of a “wide boy,” engaging frequently in fisticuffs (often to defend his younger brother, Andrew Grant) and sewing razor blades under the lapels of his school jacket (a defense against someone grabbing him by the lapels. As Child explained, “You only do it once.”). The surprise was not that he went to such lengths, remarked Child, but that he knew how to sew. These tales of a rough-and-tumble youth, Child admitted, inform the character of his series protagonist, Jack Reacher. At one point, Child was asked whether it was true that he “planned to end the Reacher series after 21 books, an homage to John D. MacDonald’s Travis McGee.” Child acknowledged he had always planned such an ending, but now that he’s nearing 21 books (this year’s Never Go Back being his 18th), he isn’t so sure anymore. He said that he had plans to kill Jack Reacher off in an appropriate manner--say, having him take a bullet meant for someone else and then bleeding out in a motel bathroom. Now, he reckons he may not do that. Instead, Reacher might just stroll into the sunset, giving Child’s daughter, Ruth (now in her early 30s), a chance to pick up the franchise. Another thing learned from this event: Child is a thoughtful wordsmith in that he considers writing a one-on-one experience with each reader. Yes, many people may buy and read his books, but when you pick up any of his Reacher tales, it is really the two of you communing. He finds that meaningful. And I think it shows in the writing. 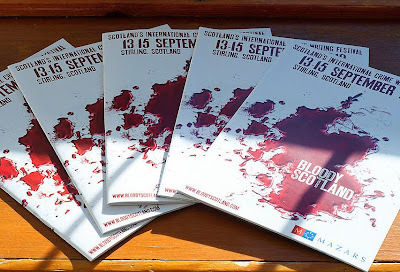 So that concludes Bloody Scotland for 2013. Next year’s festival will convene on September 19, the day after the referendum on Scottish independence from the United Kingdom is held. It should be an interesting time. Gosh, that sounds like a good time. And booze to boot? Can't beat that. Interesting take on Child's daughter being primed for taking charge of the dynasty...I reckon the way he was carrot dangling a stationary life in front of Reacher in his recent book might bespeak his sentiments for 'something different' to happen. In a recent interview with the Book report radio show (archive), Child also made mention of his intentions to keep on writing for as long as the fans wanted more Reacher. He also mentioned his next book "20 seconds ago" - which does sound very appealing.